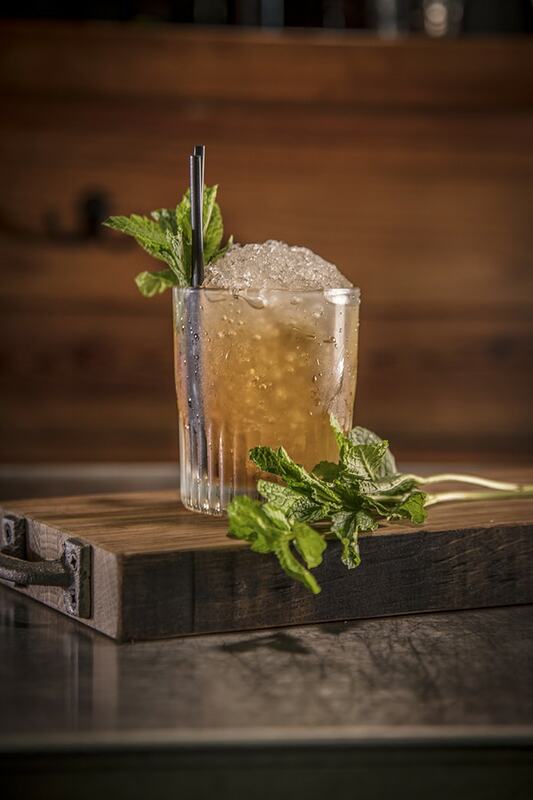 The signature drink of the Kentucky Derby. It's become a Southern classic great for more than horse racing. Use Demerara syrup in place of Simple Syrup, recipe below. Gather 5 large mint leaves (more if the leaves are smaller) and smack and pull up along the inside of the Julep tin. Discard that mint and add 1/4 fl oz demerara syrup and bourbon to the tin. Stir with a spoon, and fill the tin half way with crushed ice and swizzle for a few seconds. Move quickly and fill the tin to the top and pack, and then add the crushed ice snow cone on top. Insert two julep straws and put the mint sprig garnish next to the straws. Mix 2 parts demerara sugar or turbinado sugar to 1 part water and cook slowly on low heat, continually stirring for around 30-45 minutes. Do not allow the syrup to come to a simmer or boil during this time. Remove syrup from heat and allow to cool overnight to reach the correct consistency.